The Agria Agility Challenge celebrates all that is good in the Agility calendar. It is one of the 'must try' for annual finals for the rising stars of the Agility world. Once again it is being organised by Country Shows Agility and is open to Large dogs G1-4. 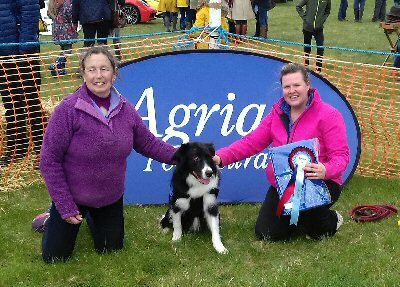 Congratulations to the first winners of the first heat of the Agria Agility Challenge 2019 which was held at Andoversford Point to Point Festival on 7th April, and attracted many of agility’s rising stars. Country Shows Agility Graham Taylor said, 'We were delighted to see Agility at the forefront of this fabulous spring event, amongst some other great family attractions. This is one of the venue’s premier equine events, and set in the lovely spring sunshine, spectator numbers were high which added to the exciting atmosphere.. The competition, appropriately judged by ex-jump jockey Veronica Hill, was every bit as exciting as we could have wished for, with five fast clear rounds taking the top five places. Beating their nearest rivals by 1.5 seconds were Becky Bryant with Batfink Bombs Away, who completed the course in just 29.761 secs. Hopefully the Andoversford weather will continue across the outdoor season as Heat 2 of the Agira Agility Challenge heads southwards to the North Somerset Show to find the next five Agria Agility Challenge 2019 qualifiers. Congratulations to our first set of finalists, and good luck to those taking part in the remaining heats! Agria Pet Insurance will continue to support the Agria Agility Challenge in 2019. With its regional heats for dogs at Grades 1- 4, this competition is for standard height Large dogs during the spring and summer, culminating in a thrilling final in September in the Top Dogs Arena at The Malvern Autumn Show. Agria Pet Insurance, recently awarded ‘Pet Insurance Provider of the Year’ and ‘Best Claims Service’, at the Moneyfacts Consumer Awards 2019, is one of the few insurers to cover dogs while they work. This includes agility dogs during training, travelling to events and competing. Agria strongly believes in animals leading full, happy and healthy lives, and so supporting agility is a natural match. Agility training enriches dogs’ lives by giving them a mental and physical outlet, enhancing their level of focus and self-assurance while encouraging a strong owner/ animal bond. Agria is proud to support an activity that fosters such positive outcomes.